Onam season calls for good and scrumptious “Onam Sadhya” and I have been craving for a while now. To satisfy my craving, I had been to “Ente Keralam” in Ulsoor. The restaurant is perfectly decked up for the festival with Pookalam and delicious Thali. I was here a couple of days before to savor the Sadhya, believe me it was very good and certainly value for money for the range of dishes served in the Thali. An unlimited thali will impress everyone for sure. 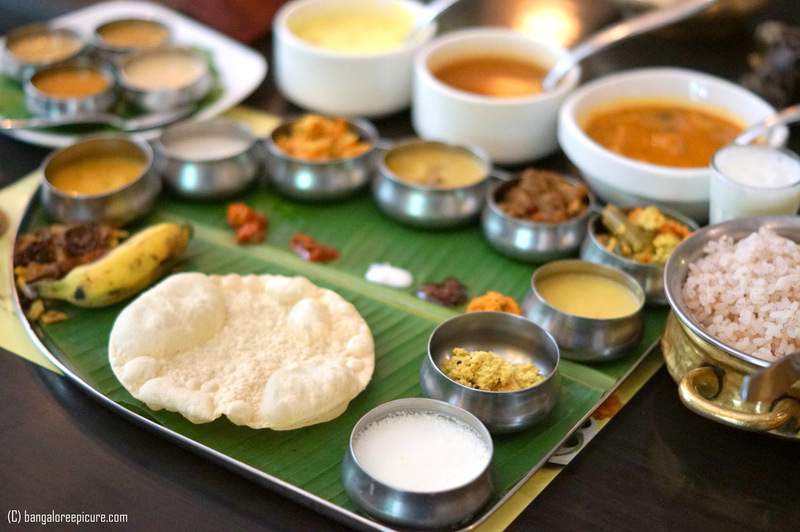 The Thali comprised of Keraleam, Sambharam, Nei Parippu, Erussery, Olan, Avial, Pachhadi, Kichhadi, Thoran, Curd, Kootu Curry, Kalan, Shakra Varati, Assorted chips, Ingi Thair, Inji Puli, Pickles, White/Red Rice, Kaachiya More, Sambar, Rasam, Banana, Pal Ada Payasam, Paal Payasam, Ada Pradhaman and Pazham Payasam – The dishes are truly droolworthy and some of them are really wonderful, which often makes you crave. Its not just a meal, it’s an experience for every foodie to try Sadhya during festival. The Ente Keralam Restaurant décor seems more like ancient homes at Kerala and they have made the place even better to give a feel of Onam Festival. The place was crowded on weekday, which is something good for establishment and also signifies how well the restaurant. The service was prompt and fast though the place was packed. Price of the Onam Sadhya is 899 INR (AI) which is certainly worth.